Great Spot for a quiet stay ... 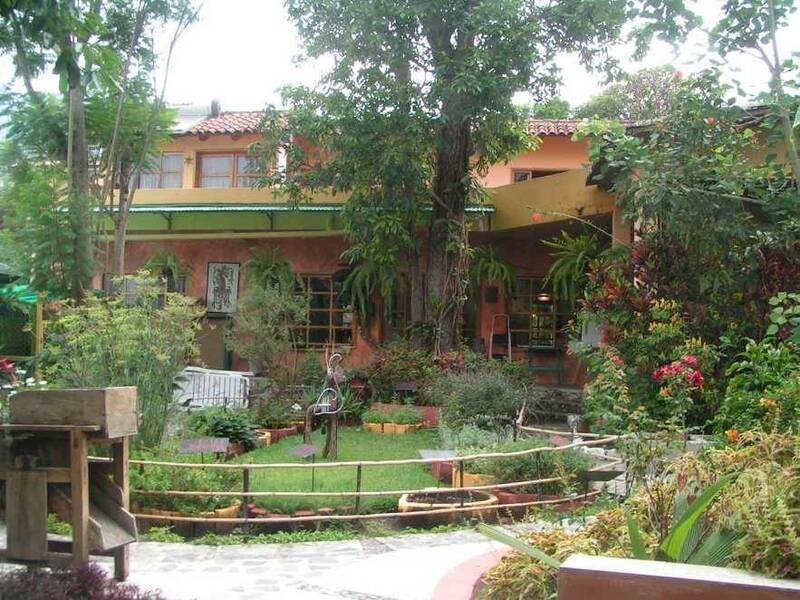 The Posada is a nice retreat on the outside of the touristy area. The gardens are great and so is the thermal water tub to relax after a day of visiting the region. 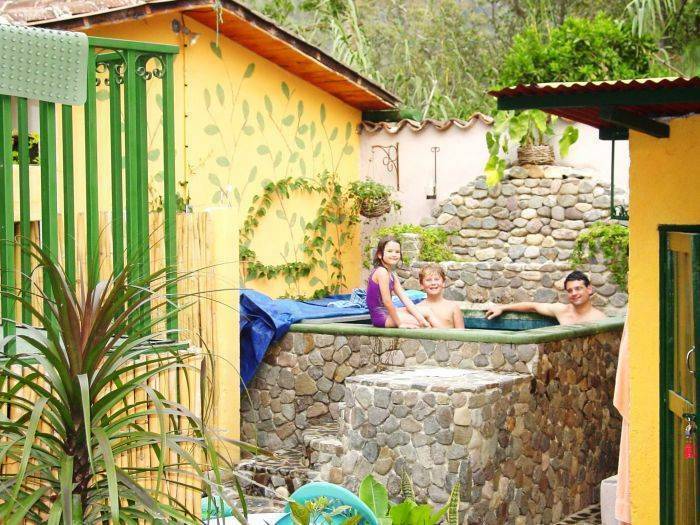 Posada Los Encuentros is an intimate lodge with three guest rooms & 4 studios, a relaxing lounge, a wood-burning sauna, a solar heated lounging pool, a natural medicinal herb garden, and a well-equipped fitness center. Our furnishings are new and comfortable. We offer nourishing breakfasts and other amenities. We are pleased to mention that we have been included in Incredible Inns of Central America by Carol Schimke, Front Door Press International, 2001. 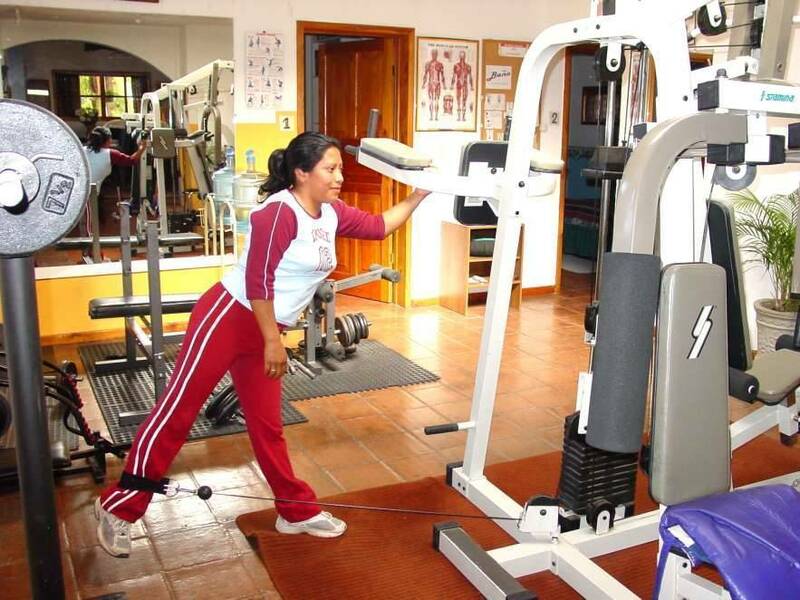 We offer structured programs that range from language and culture study to physical and spiritual fitness. We also offer a special 5-day vacation package which includes local tours as well as a number of weekend specials. If you like, we can help you stay in touch with the world "back home" through phone, fax, e-mail, and cable television, WiFi. Or, we can help you leave it far behind. Posada Los Encuentros is an intimate lodge with 3 guest rooms, a relaxing lounge & 4 studio/apartments, a wood-burning sauna, a solar heated lounging pool, a conference room, a natural medicinal herb garden, and a well-equipped fitness center. Our furnishings are new and comfortable. We offer nourishing breakfasts and other amenities. We have available (prices are per night; weekly and monthly rates also available): Garden cottage room (sleeps 2): with a double bed, private bath and cable TV. Price is $40 for 1 person; $45 for 2 people. Studio with a double bed, two singles, and small sofa-bed. Cable TV & bar fridge, private bathroom included. Price is $50 for 1 person, $5 for each additional person. Studio with fire place (apartment style; sleeps up to 4): Fully equipped kitchen area, cable TV, king-sized bed, sleeper sofa, private bathroom. Price is $60 for 1 person, $5 each additional person. 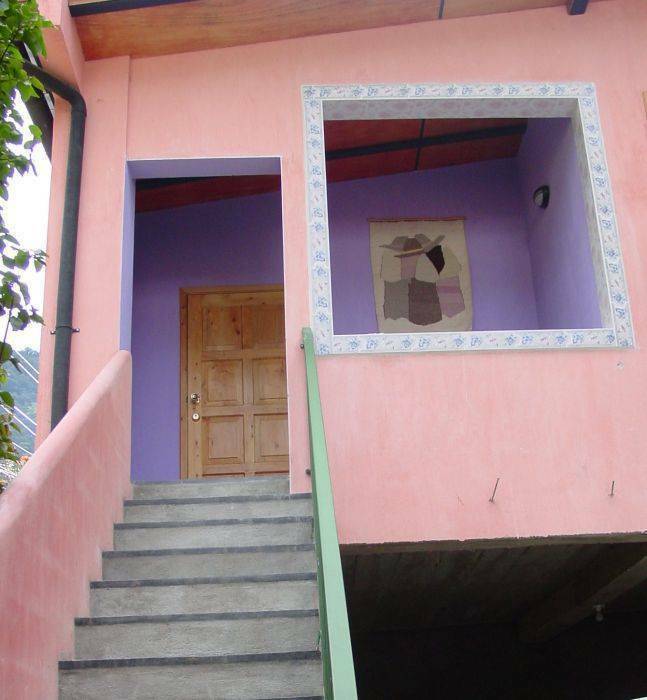 Posada Los Encuentros is located in the residential part of town, removed from business and tourist industry-related sound pollution. We are about a 10-15 min. walk from the center of town, and a 3 min. drive. Stationed right across the bridge from downtown Pana, we are an oasis in this cultural and touristic portal into the Lake Atitlan region. Dinner: Italian style, Pizza, Pastas & Live Music. Meals, sand beach & swimming pool. Malaysian/Guatemalan fusion, located in a garden plaza. Pupusas, drinks, and a friendly environment; close to clubs and bars. Tex-Mex style restaurant with great views of the Lake (especially at sundown!). Discount for Monthly Reservations and Packaged Tours! Reservation Policy: This reservation service is free. Guaranteed reservations require a deposit of first day's stay (non-refundable). The balance of of your stay is due upon your arrival with us. Cancellation Policy: After reservation, you are free to cancel for any reason and without penalty (with exception of non-refundable deposit) up to three days prior to scheduled arrival. Any later cancellations may result in additional fees. Payment: We accept payment in cash (USD [$] or GTQ [Q]), AMEXCO travelers checks, a personal check written on a US bank account, VISA and MASTERCARD credit cards (please note that payments made with credit card will incur an additional 5% service charge). There are several ATM machines and banks in Pana to facilitate obtaining cash. Some banks will usually give cash advances on VISA cards. AMEXCO credit cards are least useful, while AMEXCO travelers checks are the easiest of the travelers check brands to negotiate. The main route to Panajachel is through Solola. Following this route, one arrives directly into downtown Panajachel from Solola. The alternate route to Panajachel is through Godinez. Following this route, one arrives into Panajachel on the opposite side of town, after crossing a heavy traffic bridge spanning the Panajachel River. You will most likely be entering into Pana on the main route, arriving on Calle Principal. If you are traveling by travel agency shuttle van, confirm at the office where you book the transportation that the driver will take you to the door of your hotel. This is standard service but the drivers sometimes get lazy and, on arrival in town, try to leave you somewhere more convenient for them. Drivers invariably carry cell phones. If they say they don’t know where we are, tell them to call us for directions. They can reach us at 7762-1603 or 2093 or ask at their office in Panajachel. YOU SHOULD NOT LET YOURSELF BE DUMPED OFF DOWNTOWN. If this should nonetheless happen, call us for a pick-up. If you are traveling by commercial bus, get off the bus near the "V" intersection of Calles Principal & Santander. This is the beginning of Santander. At that intersection (but on the other side of the direction that Santander runs), is a multi-business complex with a single large entry with the sign "Comercial El Dorado." There is a coffee shop right inside the entryway where you can make phone call to us (7762-1603 or 7762-2093). The coffee shop charges 2 Quetzales. If you don't have it, tell them I will pay them when I pick you up. Or, you can take a 3-wheel tuc-tuc. But, be aware that the drivers are sometimes "Jaladores" and may attempt to dissuade you from staying at your reserved hotel for another option. Please note that deposits are often times non-refundable at most hotels. You can book all your transportations using our own Shuttle Service. Please contact us with specific details. Private Pick up from Airport Guatemala City ? 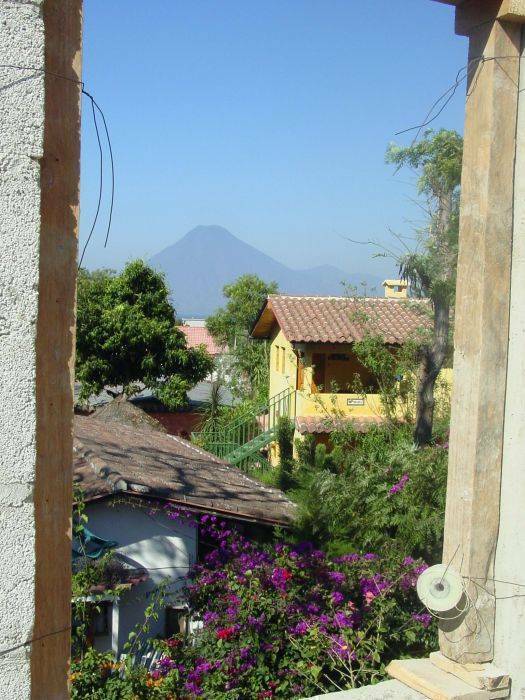 directly to the Atitlan lake - any time, up to 4 People - add $100; 5-8 add $125 (to be paid separately, directly to us in advance). Please come back to us after reservation confirmation.